Check my Free Nosejob Courtesy Of My Surfboard! Travel insurance for backpackers is something I’d highly use you to consider for your next trip – leaving home for an epic adventure without travel insurance is something I’d NEVER recommend! The world is a big place full of awesome experiences, but no matter how careful you are sometimes things go wrong…and if they do the last thing you want to worry about is how you’re going to deal with it. At the end of the day the best scenario is that your travel insurance is the biggest waste of money on your trip – because that means you’ve come back in one piece. But trust me when the sh*t hits the fan it’ll be well worth the investment. Travel insurance is a must for any backpacker or traveller. Thats why I’ve teamed up with World Nomads Travel Insurance – they’ve got a great range of travel insurance for backpackers covering a whole heap of activities so no matter where you’re heading in the world or what you fancy getting up to you can relax knowing they’ve got you back! What’s great is you can buy, extend and claim online, even after you’ve left home! It’s available to people from over 140 countries and is designed for adventurous travellers with cover for overseas medical, evacuation, baggage and a range of adventure sports and activities. Flexibility when you need it most We all know that the best travel insurance for backpackers needs to be flexible! Had a change of plans? You can extend your policy or claim online while you are still away. You can even buy a World Nomads policy if you’re already travelling. Cover for a range of adventure activities No travel insurance for backpackers is complete without covering a whole heap of activities! From skiing & snowboarding in New Zealand to whitewater rafting in Colorado, WorldNomads.com covers a range of adventure activities, giving you peace of mind to get the most from your travels. 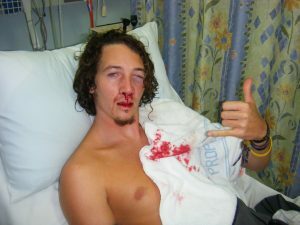 Which travel insurance for backpackers would you recommend?